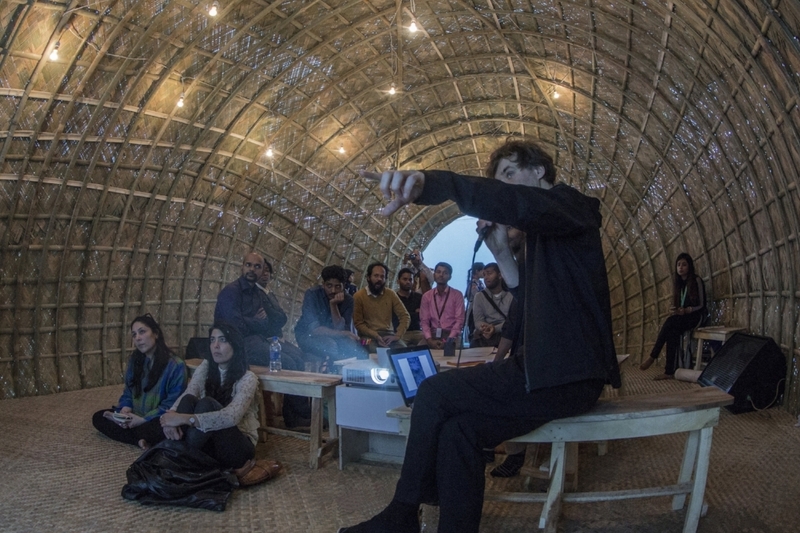 Illustrated lecture which formed part of the Education Pavilion programme during the Dhaka Art Summit 2018. Image courtesy of the Dhaka Art Summit. Photo credit: Noor Photoface. 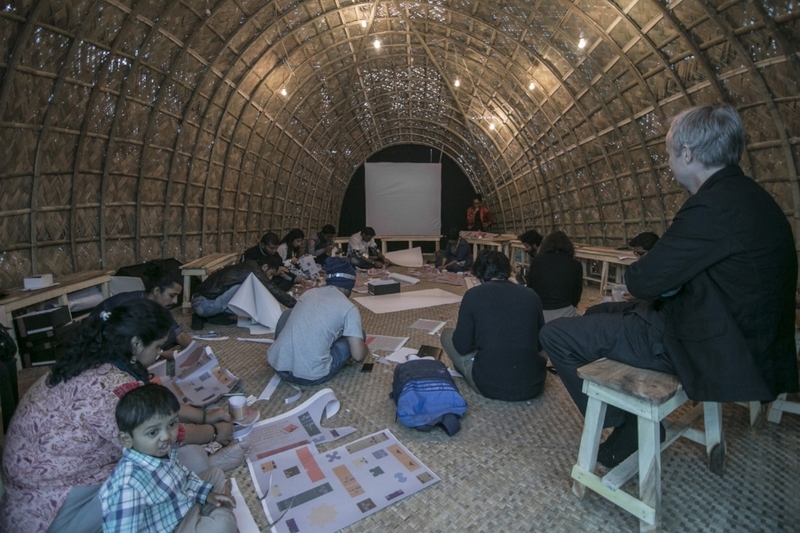 The workshop formed part of the Education Pavilion programme during the Dhaka Art Summit 2018. Image courtesy of the Dhaka Art Summit. Photo credit: Noor Photoface. A two part workshop which formed part of the Education Pavilion programme during the Dhaka Art Summit 2018. Image courtesy of the Dhaka Art Summit. Photo credit: Noor Photoface. Staff, volunteers and scouts pose with members of the OSE faculty at the entrance to the Education Pavilion. Image courtesy of Tina Rowe. Photo credit: Tina Rowe. This series of workshops was supported by the British Council. 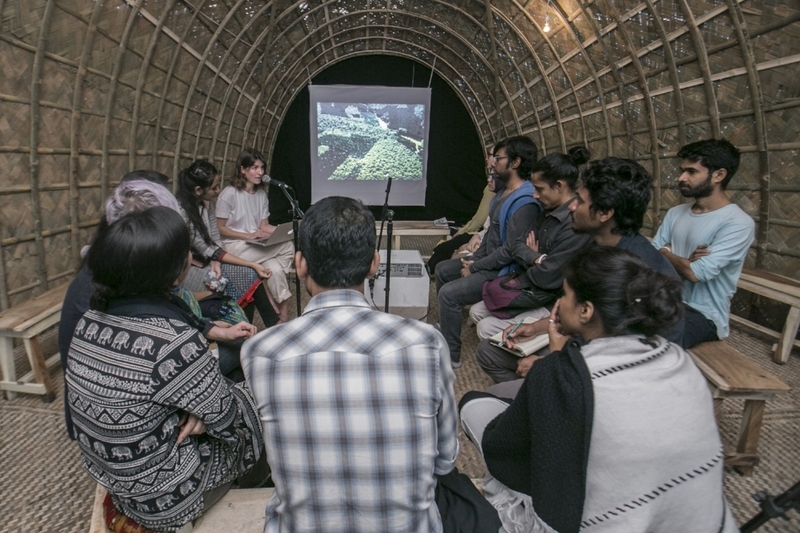 One of Open School East's workshops which formed part of the Education Pavilion programme during the Dhaka Art Summit 2018. Image courtesy of the Dhaka Art Summit. Photo credit: Noor Photoface. This workshop was supported by the British Council. This session was organised by TBA21–Academy and INTERPRT. This workshop was supported by the Lakshmi Mittal South Asia Institute, Harvard University. This workshop was supported by Pro Helvetia - Swiss Arts Council. One of Open School East's workshops which formed part of the Education Pavilion programme during the Dhaka Art Summit 2018. Image courtesy of Tina Rowe. Photo credit: Tina Rowe. The inaugural Samdani Architecture Award invited, through open call, individuals or groups of 3rd and 4th year Bangladeshi Architecture students to propose new models for learning in abandoned urban spaces across Bangladesh, using ecologically sustainable, and locally sourced materials and technology. Participants were required to design an imaginative and innovative open pavilion, both visually stimulating and architecturally flexible for different functions, including lectures, events and workshops. From 135 registrations, Maksudul Karim’s (b. 1996) design, Chhaya Tori (ছায়া তরী), which translates as Shadow Boat, was selected. A level 3, B.Sc. Architecture student at Premier University in Chittagong, Karim’s design utilises traditional Shampan boat building techniques—synonymous with Bangladesh’s fishing communities—bringing traditional rural Bangladeshi construction techniques into the urban environment. Karim’s design will be unveiled at the heart of the Bangladesh Shilpakala Academy as the Dhaka Art Summit 2018’s Education Pavilion. Committed to nurturing the next generation of artists, the Education Pavilion will transform DAS into a free art school for the creative community of Bangladesh. Re-imagining the traditional toolboxes used when considering art-making and artistic practices, this free and alternative art school's curriculum is led by leading artistic practitioners and educators from institutions including: Goldsmiths University (UK); Yale School of Art (USA); Cornell University (USA); Kalabhavan Santiniketan (India); Harvard, South Asia Institute (USA); Lucerne University of Applied Sciences and Arts (Switzerland); Open School East (UK); Council (France); and the FHNW Academy of Art and Design (Basel, Switzerland); among others. Programmed across DAS’s nine-day duration, the Education Pavilion will host a bilingual, collaborative curriculum, developing a timely and productive discussion about art education in South Asia through free workshops, lectures and master classes.